“Arsenic and Old Lace” was performed on Friday 18, and Saturday 19 June 1948. 'Arsenic and Old Lace'' is actually farce— a murder farce. The play's theme is murder— on a mass-production scale. Novel twist is that the murderers are known early in the first act: they describe their method of eliminating people and disposing of the bodies— which may sound gruesome, but actually is uproariously funny. 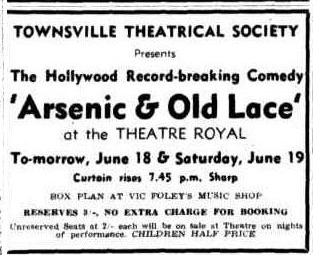 Showing much courage and enterprise, the Townsville Theatrical Society presented 'Arsenic and Old Lace' at the Theatre Royal last night; judging by the constant ripple of laughter through the crowded house, their efforts succeeded admirably. While described as a comedy, 'Arsenic and Old Lace'' is actually farce— a murder farce. The play is famous, having enjoyed extensive runs in the world's major cities; Townsville is fortunate in having the opportunity to see the play on the legitimate stage. The members of the cast in the first act are to be congratulated on never allowing their lines or the atmosphere to border on the macabre; the situation was explained in light-hearted and matter-of-fact manner, which left the audience highly amused. The story revolves around a Brooklyn family that, with one exception, are as lively a bunch of lunatics as ever graced a stage. To give an indication of the plot would spoil the pleasure of those people to whom the play is not known. Suffice to say the author chose an unusual subject from which to extract humour, and succeeded in hilarious fashion. Farcical situations are in super abundance, and the dialogue includes several shafts of good wit. Above all, the show is first-class entertainment, smoothly produced and presented in outstanding manner. There are no leading players in the accepted sense of the term: practically the entire cast play major roles. The society presented more newcomers last night with a sprinkling of well-known performers. Again it demonstrated the remarkable talent it has at its disposal. The entire company was convincing in difficult roles; the wrapt attention with which the audience followed every word and gesture last night was sufficient proof on that score. 'Arsenic and Old Lace' is the Townsville Theatrical Society's most ambitious offering to date; the play called for a tremendous effort on the part of producer, cast and technical personnel; all concerned have reason to feel proud of the production. Special mention must he made of the settings, which prove the high standard the society has attained with its shows. The settings were a tribute to Messrs. G. Wiedeman, J. Rooney and W. Hammond, who handled that important aspect. Those who like good entertainment should not miss 'Arsenic and Old Lace' — but one word of warning: it is not a play for children, in the third act the action descends, for a few moments, to horror level; then swings back to legitimate comedy. Adults, however, will revel in the show, and will agree that, with this production, the living stage is firmly established in Townsville and has come to stay. Credits go to Elizabeth Hindman, Joe Anderson, Carl Schuchard, Kingsford Arrowsmith, Fred Eske, Mavis Colban, Nan Wilson, Eric Rees. Jim Stoneham, Arthur Krause. Keith Brazier. Vernon Crew. Chris Lander and R. S. Costello for fine acting performances; to R. S. Costelloe and Mabel Pingel for smooth production, and Rita Fell. Len Newman. Allen Stephenson. F. Whitechurch, Eric Jell, E. Colban and J. Hall for technical work. Mrs. Summerfield's Orchestra supplied extract music. The play will be presented again to-night. UNUSUAL TROUBLE FOR CAST IN STAGE SHOW. Back on the job again at the Adult Education Centre is Mr. Vernon Crewe, who directs the centre's activities in Townsville. Mr. Crewe went down as a victim to a severe bout of 'flu during the presentation of the Townsville Theatrical Society's production of 'Arsenic and Old Lace.' In the role of a policeman, Officer O'Hara, he got through the first night's show, but was too sick to appear on the second night. Oddly enough, another 'policeman' in the cast was also absent on the second night— Chris Lander, in the role of Officer Rooney, was involved in a car accident and unable to appear. It is unusual for a two-night show to suffer cast trouble in such fashion. Mr. Crewe, incidentally, is an outstanding actor. He has the rare attribute of sinking himself in a role and being absolutely oblivious of the audience, with the result be gives a convincing performance.